The Islamic State, also known as the Islamic State of Syria and Iraq or Daesh, is now deemed to be global threat, that has effectuated a military coalition between the political giants (The USA backed by North Atlantic Treaty Organization (NATO) Countries and the Russian Federation with its trusted ally Iran) of the world to counter radical fundamentalism. China, with its oil interests in Syria, is also expected to join the fray on the side of Russia. Most people would suppose that this is a global effort of good (the world) against evil (ISIS), but this view would overlook the close proximity this platform has brought two volatile and powerful forces into, and the precarious balancing act being carried out in the Levant region. With NATO and Russian forces on the ground, a direct military confrontation between the two is almost inevitable and even a minor accident like a stray missile from a drone or bomber may result in the beginning of the Third World War. That is exactly what almost happened on the 24th November 2015. The interception and shooting down of a Russian aircraft by the Turkish Airforce had pushed the world on the brink of a full-scale conflict, with tensions and emotions running high. But to conclude whether the situation will build up to World War III, an analysis has to be made on the factual situation, legal implications, controversies and the stand taken by the stakeholders in this incident. 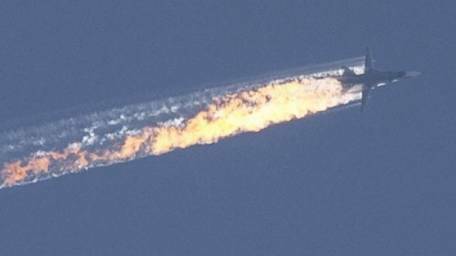 Russia has invaded Turkish airspace right since its advent into the Middle Eastern crisis. Prior incidents of such acts have prompted sharp reactions from Turkey, with warnings strongly inclining towards a shoot down. However, comments made in fiery bursts of sovereignty turned to actions when a Russian Sukhoi Su-24 long-range bomber deployed to target ISIS within Syria was intercepted and shot down by two Turkish F-16 fighter jets, on account of violation of airspace. The Su-24 was cruising at 6000mts when it was said to have been hit by Air-to-Air Missile, causing it to crash in the Jabal Turkmen mountainous region in rebel-held Latakia Province, Syria. The jet was said to have been flying over a three-kilometer-wide Turkish territory that indents into Syria. However, this claim is highly debated in the international circuit as Russia repeatedly denies Turkey’s claim of violation of airspace. This, apart from being a major hurdle in the global effort against IS, has resulted in confrontation of NATO and Russia, which is something that the world has managed to avoid from World War II, all the way through the Cold War and up to this very day. Though incidents like the Cuban missile crisis come to our mind when we think of a stand of between USA and Russia, the current incident may have much more severe implications. With Russia and the United States having 90 per cent of the world’s nuclear arsenal, which is made available to other countries through treaties like the Nixon Doctrine, (by which America shields its allies with a nuclear umbrella) the stage is set for a global conflict, if aggression increases. The invasion of airspace is a violation of the territorial rights of a state. Such incidents happen on a daily basis and reports by the news agency R.T. show that Turkey itself had violated Greek airspace 2244 times in 2014 alone.Though there isn’t any international nomenclature providing a legal framework for violation of airspace; The Chicago Convention of 1944 is referred to while dealing with the subject. Though being very vague about airspace violation and just a slight modification of the principals found in the Paris Convention of 1919, this convention strongly codifies a pre-existing principal of customary international law i.e. that every state has complete and exclusive sovereignty over its airspace which also extends to the air over its territorial waters. This convention grants the Right of Innocent Passage to any civilian or commercial flight between two contracting countries and the only part dealing with violation of airspace is Section 3, which limits the right only to civilian aircraft and not to state aircraft, which are aircraft used for military purposes, that could potentially threaten the security of the state they fly over. The only remedy states have in such instances is to knock on the doors of the International Court of Justice, in an attempt to avail whatever little compensation possible along with a humble apology. The statistics showing global airspace violations are very high; nevertheless such matters get solved within minutes between the air controllers and the pilots, with very few interceptions and shoot downs, which occur at extremely rare occasions. Keeping in mind what petty a crime violation of airspace is considered to be, instances of such isolated strikes are driven by rather covert intentions, much more serious than mere territorial trespass for a few minutes. For example, the USS Liberty, a US intelligence and reconnaissance vessel traversing the Israeli coast during the Six Day War between Israel and the Arab countries was bombed mercilessly and heavily by IAF’s Israeli Mirage-2000s, on the pretext of violation of territorial waters. However reputed journalist Antony Pearson, claims in his book called the “Conspiracy of Silence” that the bombing was actually carried out to destroy intelligence obtained by the vessel, which beyond doubt proved that the War that resulted in the illegal occupation of Palestine, was actually a sly operation executed by the Jews to satisfy their vested interests in the region. Another finding that hints towards a cover up is that two Belgian astrophysicists have proven the science of the crash completely wrong. Saying that the Su-24 jet presumed to have been flying at a speed of 980 k mph would have reached central Russian within the five-minute window the Turkish authorities had given it to leave their airspace before shooting it down. According to them, the three-kilometer indent could have been covered by the plane in under a three seconds and the explanation provided by both the sides is wrong scientifically. They don’t claim a political controversy but only rubbish the science, leaving the former to be questioned and commented upon by the international relations fraternity, investigative journalists and controversy theorists.A full attachment of their findings can be located in this footnote. Whether the current incident was a result of such a hidden intention? We may never know. Nonetheless, both the blocks have strongly justified their actions. Russia through its premier Vladimir Putin has condemned the attack with vigor and has promised to avenge the attack. In this regard, Russia has imposed heavy economic sanctions on Turkey that could cripple its economy and also published statements accusing the Turks of supporting their fuel industry by buying oil in huge quantities from is controlled oil fields. They have also bombed and destroyed a train of trucks carrying oil to turkey supposedly originating from IS territory.He, however, ruled out the possibility of a war by saying no weapons will be used against turkey but the harsh tone reflects the anger prevailing among the Russian authorities. Turkey defends its actions as well alleging that all its warnings were disregarded. The NATO anticipating aggression called for an urgent meeting to be held at its headquarters in Brussels showing the seriousness of the situation. Such occurrings are frequent on the international platform, it is highly important that states maintain calm and focus on the combined goal of ousting the Islamic State. However further precautions must be taken and tolerance also should be increased in order to develop corporation. Though this event will not snowball into World War III, but could have gone either ways keeping in mind the highly volatile situation. This incident has led me to ponder upon a question, with hot stew bubbling away in Syria, the help being sent by all the states is any good or just spoiling the broth?! Nazeer Uddin Khan is currently a VIII Semester Student of Faculty of Law, IFHE, Hyderabad. He is an avid follower of International politics. In his past time he attends MUNs and writes about international scenarios.